BC Teachers of English as an Additional Language (BC TEAL) is an organization of educators dedicated to the growth and development of the profession of English language teaching. Their old website had become bogged down with excess content and unused features, so they came to KIMBO Design looking for a website content audit, website redesign and development, and a brand refresh. They also needed an integration of several third party services, which would help with the organization and logistics of their annual conference. The old BC TEAL website was very confusing to use, for both users and administrators. Updating content was neither easy nor intuitive, because the content structure was quite disorganized. On the website’s front end, it was not responsive, had a confusing navigation menu, a messy information architecture, and small fonts that made it difficult for people to read. The old website was using a highly customized WordPress backend that made it impossible to update the WordPress framework, because of fear that it would break much of the functionality. Adding to this was the very old version of WordPress being used, as well as the many obsolete WordPress plugins. The combination of all of these factors made the website a drain on the organization’s time and money, due to difficult maintenance. Additionally, the old website had its Event Registration integrated into WordPress, which made it a hassle for BC TEAL staff to administer. This was especially the case for users who wanted refunds or wanted a reprint of their receipt. We wanted to offer them a website solution that removed all of this wasted time, money, and energy. 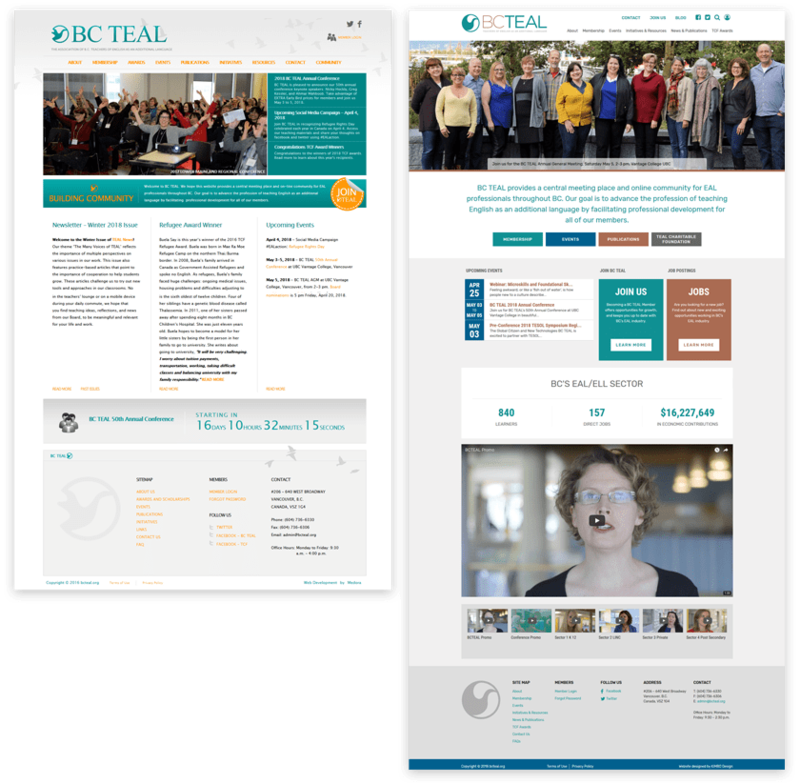 The BC TEAL website before and after images of the front page. KIMBO Design did an excellent job in supporting BC TEAL with a new website and logo refresh. Our site design required a high level of technical expertise that included integrated payment options and a number of special features – KIMBO staff delivered. We particularly appreciated the backend functionality, and our association members have commented very positively on our fresh new look and the site’s mobile accessibility. Thank you KIMBO! While developing the new website, we consulted and worked directly with BC TEAL staff, to ensure the usability was at their level. 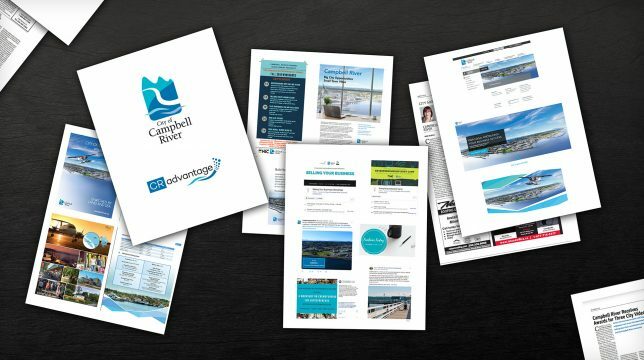 This began with a complete overhaul of the website design and information architecture. We updated the BC TEAL logo, within the organization’s existing colour palette, along with developing clean new web page templates for the home and interior pages. As with all of our website designs, we ensured that it was responsive for use on phones and tablets. The BC TEAL logo update before and after. Our web development process had ease of use as the primary factor. We used the latest WordPress version and plugins to keep the website state-of-the-art, and easy to update. Membership benefits are also a big part of the BC TEAL website, so we included better user management tools for managing memberships. We also included a streamlined payment process for membership registration and renewal, as well as a “pay by cheque” option, for people who don’t have credit cards, so that they can pay for membership registration, membership renewal, and donations. Much of the BC TEAL target audience/membership are older, so we included bigger fonts for increased readability of website content. 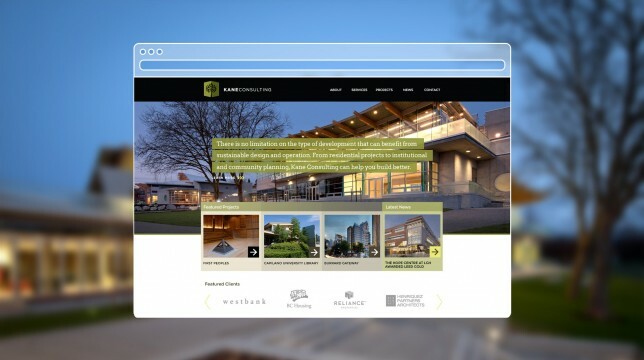 The purpose of increasing the website’s ease of use was to remove the burden from BC TEAL’s web coordinators, making the website cheaper to operate for the client. 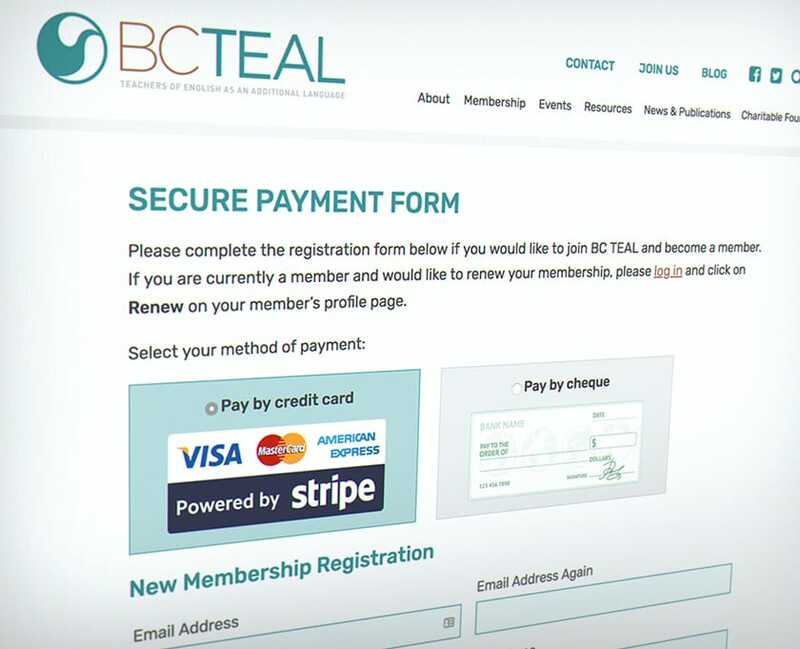 Our redesigned and developed BC TEAL website was launched before their first major conference, which allowed users to register on the new website in a more streamlined process. Tickets to the conference were purchased via Eventbrite, which was much better because it didn’t require BC TEAL staff to administer any transactions. Users could print receipts and get refunds by logging into Eventbrite on their own. Members attending the conference were extremely complementary about the new site, with the overall attitude that the website redesign was very successful. 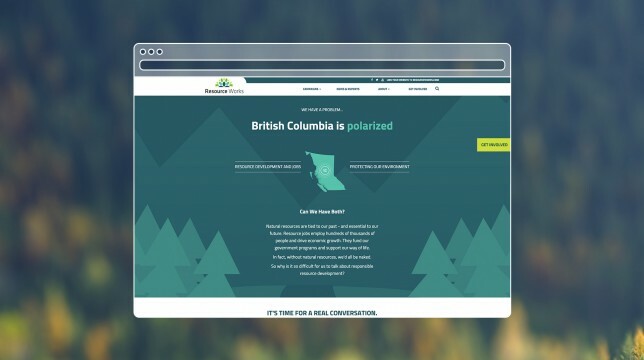 Behind the scenes, the new BC TEAL website costs less to operate because it is being hosted on a more efficient web server, without paying for the extra bells and whistles of the past. The new website’s backend is also much easier to use, easier to update, and easier to maintain, which has been vocalized to us by BC TEAL staff.